So we are giving you another way to incorporate oats in your diet! 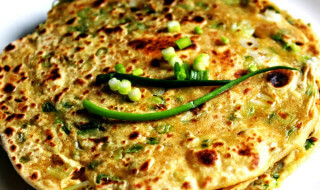 Presenting the oats and spring onion paratha which combines the flavours and nutrients of spring onion along with fibre of oats. Combine all the ingredients in a deep bowl and knead into soft dough using enough water. Keep aside. When the seeds crackle, add the garlic, green chilli paste, mix well and sauté on a medium flame for a few more seconds. Add the spring onion whites and sauté on a medium flame for 1 to 2 minutes. Roll out each portion into a roti, using a little whole wheat flour. Place the roti on a flat, dry surface and spread a portion of the filling over it. Place the other roti circle over it and seal it tightly. Cook the paratha on a non-stick tava, using a little oil, till it turns golden brown in colour from both sides.